Baba is honestly like no other puzzle game I can think of, one where you are literally changing the rules of the game to progress through each level and it's a magical experience. Truthfully, I thought it would be quite a simple game considering the mechanics but I've been massively surprised overall. Baba is a game about thinking logically and throwing logic out the window at the same time. Logical because the blocks are all simple functions but it's completely illogical what you're doing. Some levels I really did spend an inordinate amount of time, just sat there thinking and trying various things. Baba is a game that loves you to experiment and fail, especially with the ability to just step back an action as many times as you like. There was one particular part early on I remember very clearly making me laugh out quite loud. I had to overcome some skulls which killed me on touch with no way to get over them, so thinking they wouldn't do it to a wall I moved the rule blocks around to turn myself into a wall. I obviously wasn't thinking it all through, as I honestly thought I would just turn into a single bit of a wall, but oh no—I became the entire section of walls in the level and so I just moved the whole wall onto the finishing flag and it was glorious. It left such a lasting impression that I was giggling as I typed that too! Another simple example: Lava is hot and so it will defeat you. Okay, let's rearrange some blocks, so instead of pushing rocks you push lava and simply move it out of your way. Want to know something else that's cool about it? The developer is giving away 10% of their personal income to charity, with Giving What We Can named in the game's splash screen. 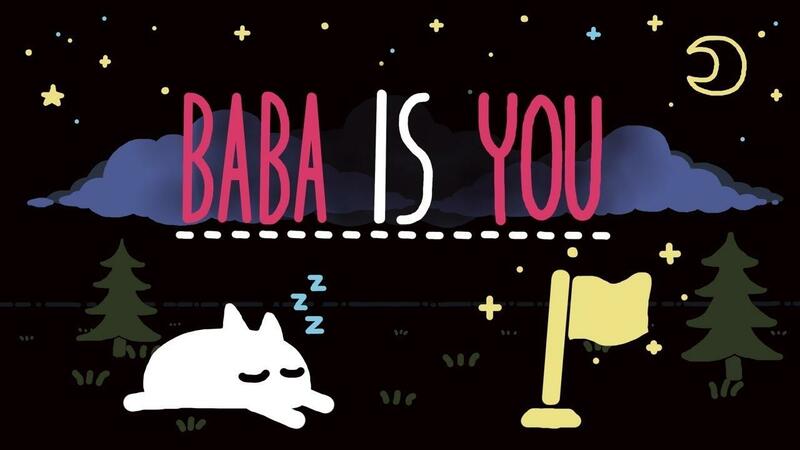 Baba Is You is available on Humble Store (DRM-free + Steam key), itch.io and Steam. I very rarely become this so deeply engrossed with a game, I just didn't want to put it down. I love this game, it's a headscratcher, but most puzzles I've solved so far have multiple solutions, and that's great! Really brings up the will to experiment. My only issue with the game is that they want $15 for a puzzle game with basically no graphics to speak of. Sounds like a very cool puzzle game, and I'm not saying graphics is what makes a game good, but that it seems like an unfair amount. Hard to know for certain without knowing how much money they've gotten, though, but given its attention no doubt it has been quite a bit and I wouldn't be surprised if they already have made up for the cost of making the game. Swiftpaw My only issue with the game is that they want $15 for a puzzle game with basically no graphics to speak of. Sounds like a very cool puzzle game, and I'm not saying graphics is what makes a game good, but that it seems like an unfair amount. Hard to know for certain without knowing how much money they've gotten, though, but given its attention no doubt it has been quite a bit and I wouldn't be surprised if they already have made up for the cost of making the game. Same for me, but I simply wishlisted it and will wait for sale, so no biggie. God, I adore the visuals in Baba. It reminded me of Little Big Planet for some reason a lot. Maybe even some Tearaway (sorry for talking about non-Linux games, guys). Can anyone advise some more games like this that are not included in this list rawg.io/games/linux/puzzle?